Get a quick, expert overview of risk management in transfusion medicine from Dr. James Mills Barbeau. This practical resource presents a summary of today’s state-of-the-art techniques for reducing harm during all phases of transfusion practice, including blood collection, testing, processing, clinical assessment, and transfusion. It’s an easy-to-read, one-stop resource for managing and mitigating the various levels of risk in a variety of transfusion settings and scenarios. Presents a well-rounded perspective on quality assurance, blood supply testing, clinical risk, ethical and legal considerations, and transfusion-transmitted infectious diseases. Demonstrates how transfusion risk-management programs add value to health care institutions by enhancing a culture of safety, improving the institution’s reputation, and improving the bottom line. 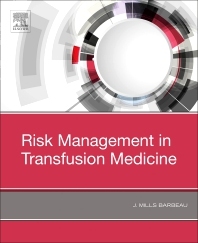 Consolidates today’s available information on risk management in blood transfusion medicine into one convenient resource.